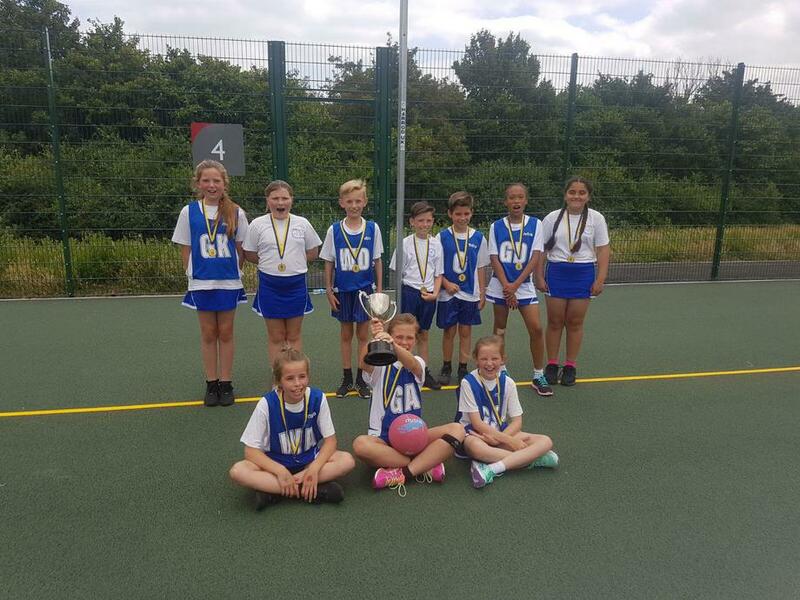 Clockhouse conquer the Borough and life the Netball Trophy! Clockhouse made the nearby trip to the Broxhill Centre yesterday afternoon for the netball borough cup finals day. After winning the league, Clockhouse were to play Ardleigh Green in the semi-final. When the two teams met previously in the league the game finished in a seven all draw. Ardleigh Green are widely known for their sport but Clockhouse set the pace of the semi. Going 3-0 ahead in the opening minutes, scoring from every attack, leaving Ardleigh Green clueless as to how to combat the Clockhouse attack. Scores coming from a Gracie H double & Lily S-E.
As the game went on Ardleigh Green grew into the game but after a worrying injury a fired up Paris K, along with Beth C & Atiya R were not to be defeated limiting the Ardleigh Green scoring to just two. The game finished with Bobby B supplying Gracie H who scored her third of the semi-final in a dominant display from start to finish ensuring Clockhouse were through to the final winning 4-2. In a repeat of last year's final Clockhouse met a very strong Parsonage Farm side who were the defending champions. Similarly the final was to be a mouthwatering game and a credit to the game of netball! The game can only be described as an end to end clash. Clockhouse took the lead, maximiamising our wing play as Kayleigh M linked up nicely with Sophie L, who in turn found captain Gracie H in the shooting circle to give Clockhouse the lead. Despite some tenacious defending Parsonage Farm hit back. Clockhouse used one of their centre pass moves to find a route back to the semi-circle in a fast smooth move with Gracie H scoring again. Parsonage Farm responded to again level the scores. Just before half time Gracie H's hat trick gave Clockhouse the narrowest of half time leads following more fluid fast paced passing. After the half time break Parsonage Farm made a couple of positional changes and picked up the pace of their attack. This resulted in Parsonage Farm drawing level again. But Clockhouse's forth score in the final came with more brilliant build up play this time starting with Charlie B who linked up nicely with Sophie L & Gracie H. The key pass coming from the captain who linked up with Lily S-E after a penetrating run to find space and give Clockhouse the lead for the fourth time. But just like the previous three times Parsonage Farm drew level again with a good team score. At 4-4 the game was far from over. With just two minutes remaining on the clock Parsonage Farm took the lead for the first time in the final. The Parsonage centre created a chance for the ever strong Parsonage goal attack. But today was to be a Clockhouse day with shooting partners Gracie H & Lily S-E linking up once more following another driving run onto the ball from Lily S-E who doubled her total in the final and once again tying the game at 5-5. With 40 seconds to play Clockhouse attacked one final time and Callum L who had began to gain the upper hand in an amazing centre contest, passed first to his sister Sophie L and then to Gracie H who looked once more for the hard running line of Lily S-E. But this time Lily was accidentally hit to the floor by the Parsonage Farm goal keeper who could not keep up with Lily's movement and positional play. Despite the tears Lily picked herself up and played on. This foul gave captain Gracie H center stage and the opportunity to win the final. From the edge of the semi-circle Gracie H scored arguably the most important goal of her Clockhouse career with an amazing long range shot which ensured that Clockhouse, for the first time ever were crowned Havering Borough Cup CHAMPIONS!!! After the final Mr Yarrow said 'before I do anything else I'd like to personally thank Miss Ettridge for her continued contribution to this fantastic team. Thank you also to the parents for their support and to Parsonage Farm for a fantastic Final! The team played some incredible netball and despite the strength of the opposition this tough determined Clockhouse team deserved the win as they were the best team on the day in my opinion. This is the schools third trophy in a fortnight, our second netball trophy of the year. But as anyone who knows me will know I have a soft spot for netball and it is a sport I never thought I would feel so passionately about. In previous years with fantastic netball squads we have harshly been refereed out of a semi-final and lost in an agonising final, but today with Gracie H, Callum L, Atiya R, Bobby B, & Paris K representing the school for the last time we won a trophy that personally means so much to me. I am so so proud of every child who represented the school and ensured for the first time ever we were crowned champions of Havering. Ironically, despite all of the fantastic netball on show from the team and having conversations with other teachers that included quotes like 'your team have gone from strength to strength this year, they are truly untouchable' and 'the standard of this final is better than a top level year 7 game', my highlight and a true moment in my teaching career I will never forget was when I was sitting on the court after the final whistle and captain Gracie H came and sat next to me and said 'We did it Mr Yarrow!' Moments like that is why I would give up my free time for these exceptional children, creating memories that hopefully they will cherish forever!!! It has been a pleasure training these children who have gone the extra mile all year but especially over the past fortnight! They have been dedicated and stuck to the game plan and our style of play that has gave us so much success. The great news for me is Kayleigh M, Charlie B, Sophie L, Beth C, are Lily S-E are all still with us next year to take us forward once again. CLOCKHOUSE HAVERING BOROUGH CUP CHAMPIONS!!! SQUAD: Gracie H (c), Atiya R, Beth C, Paris K, Charlie B, Kayleigh M, Bobby B, Callum L, Sophie L, & Lily S-E.